There is something quite magical about the Avebury Stone Henge and I felt it was a special place without even looking into the history of the site , for me I felt more at Avebury then I did at Stone Henge, which quite surprised me as I expected to feel the opposite way round, but after researching in to it I kinda see why now I may have felt this way. Avebury lies in the heart of the Wiltshire Downs just west of Marlborough (known to be the most ancient borough in England). Avebury Stone circle is a Neolithic henge monument one of the largest stone circles in the world and is older than Stone Henge, but unfortunately less well-known and I urge anyone who is taking a trip to Stone Henge to pop by Avebury to take a look for yourselves. Over several periods Avebury Stone circle has been added too and altered. It currently has half a village within it and is claimed to be the only stone circle in the world to have a pub and chapel sit within it. The site to this day consists of a grass-covered, chalk-stone bank that is 1,396 feet in diameter (427 meters) and 20 feet high (6 meters) with a deep inner ditch having four entrances at the cardinal compass points. Just inside the ditch, which was clearly not used for defensive purposes, lies a grand circle of massive and irregular sarsen stones enclosing approximately 28 acres of land. This circle, originally composed of at least 98 stones but now having only 27, itself encloses two smaller stone circles. The two inner circles were probably constructed first, around 2600 BC, while the large outer ring and earthwork dates from 2500 BC. The northern circle is 320 feet in diameter and originally had twenty-seven stones of which only four remain standing today; the southern circle is 340 feet across and once contained twenty-nine stones, of which only five remain standing. There is a ditch which surrounds the stones and there is some evidence that this ditch was once filled with water, thereby giving the inner stone rings the appearance of being set upon an island. In the 14th century or possibly slightly before, local Christians damaged, toppled over and broke up and buried many stones to rid pagan religious practices deeming it as being the work of the devil. In 17th and 18th century, more religious stones was removed and damaged due to the same reasons. In the 1930’s, anthropologist, Alexander Keiller, spent today’s equivalent of £2 million to partially restore the site. Built in about 3000 BC, the Sanctuary was originally a complex circular arrangement of timber posts, which were later replaced by stones and now concrete slabs. Its function remains a mystery, believed to possibly be the dwelling place of some revered person, and certainly huge numbers of human bones were found here, accompanied by food remains suggesting elaborate death rites and ceremonies. Only 1500 meters south of the main Avebury rings stands Silbury Hill. Silbury Hill is the largest, and perhaps the most enigmatic, of all megalithic constructions in Europe. compares in height and volume to the roughly contemporary Egyptian pyramids. Completed in around 2400 BC, it apparently contains no burial. Its purpose is still a mystery and out puzzles them all out of all the sites within this area, across the countryside where it is, there is a crisscross effect, that consists of numberous lines of stand stones and mysterious underground chambers, many positioned according to astronomical alignments. Recent research of John Michell, Paul Broadhurst and Hamish Miller, determined that the Avebury temple was part of a vast network of neolithic sacred sites arranged along a nearly two-hundred mile line stretching all across southern England. Positioned directly on this line are the great pilgrimage sites of Glastonbury Tor and St.Michael’s Mount. This article now relates back to my first, Some people believe that Avebury may have had some input from Aliens on the construction of the build, as well as having the same input on Stone Henge. As I have stated in my first, this whole area of Wiltshire, especially the area surrounding Stone Henge and Avebury is a hot spot for crop circles with Silbury hill being a centre piece for these formations. To read part one please click this link. Regulars at the Red Lion, the pub which stands in the centre of the circle, are remain tight-lipped about this explanation, which is one of many to have been suggested down the years. Apparently the stones are identical to ones on Mars called Cydonia and are arranged in the same formation! Exactly when the Ancient Order of Druids began their annual summer solstice celebrations at Stonehenge is unclear and the celebrations that occur at Avebury, but it is understandable why Druidry takes place here, if it is indeed believed that Druids built both. Druidry was the native spiritual tradition of the people’s who inhabited the islands of Britain and Ireland, spreading through much of Europe. Though many consider it to have been a religion or political force that came to Britain with the influx of culture concurrent with the Iron Age, it is increasingly understood, and acknowledged, to be of an older indigenous if ever-evolving religious tradition sourced within these islands. As an ancient pagan religion, Druidry is based on the reverential, sacred and honourable relationship between the people and the land. In its personal expression, modern Druidry is the spiritual interaction between an individual and the spirits of nature, including those of landscape and ancestry, together with the continuities of spiritual, literary and cultural heritage. Most Druidic practice is celebrated openly. Public ritual ceremonies marking the seasonal festivals are open and free to all. Examples of these include the gorseddau at Avebury and Stonehenge. The wishing Tree / sacred tree / the ancient tree / magic tree…..there are many names given. As I walked around Avebury Stone circle I came across 3 amazing exposed beech trees, where the roots are on show they sit on top of a slight hill. Upon the roots and trees there are offerings. Offerings of love, peace and wishes, people will also walk between them and whisper a prayer or a wish to the tree spirits of the gods/ goddess of this ancient land. A peaceful spot that is a main site for Druid rituals. Traditional folk magic suggests that Beech wood or leaves can be carried to enhance the flow of creativity (so in druidic terms, it has a connection to the flow of Awen). It’s also associated with wishes, where one folk magical tradition has a person write their wish on a beech stick, then bury the stick in the ground. As the stick returns to the earth through the natural process of decomposition, the wish will be manifested in the world. A final piece of folk-lore suggests that beech is also tied to prosperity. Lovers had craved their names into the Beech tree as it is believed that their love will grow with the tree. The West Kennet Long Barrow is situated on the skyline to the south of Silbury Hill. It is a 104 metre long earthen bank with a series of stone chambers at its eastern end. At around 3700BC it was constructed centuries earlier than Silbury Hill or Avebury Stone Henge. It appears to have been in use up until about 2200 BC when for some reason it was closed off. There is still some mystery about how it was used. It is obviously of some funerary importance as when excavated the remains of 46 people were found within the stone chambers, at least a dozen of whom were children. It is now accepted that long barrows were more than just tombs and were almost certainly the focus of other rituals that were important to the society who built them. Its prominent hillside position and the fact that the barrow is aligned east/west would appear to be meaningful. The direction of the rising sun would seem the most obvious reason for such an orientation. Many see barrows as a door to another world – a liminal, a place of intense spiritual awareness. The remains of offerings are frequently found within: fruit, flowers, corn, candles and incense are a reminder of how important the barrow is to some. The barrow, which is now part of the Neolithic Avebury complex, is one of the most visited and best preserved burial mounds in Britain. It may also claim to having one of the oldest hauntings in the country, if not the world. It is said that at dawn on the longest day, the figure of a man dressed in white robes, possibly the ghost of one of those who were buried within the tomb, has been seen standing on top of the mound accompanied by a large powerful hound with starling red ears. The pair are said to stand silently and quite motionless at the barrows eastern end, presumably waiting for sunrise. At first light, they turn in unison and enter the tomb below. Several local farmers, who’s profession ensures an early start, have witnessing this strange eerie spectacle. There have been occasions where people have reported intense feelings of dread when inside the tomb. Some even claim to have seen figures moving therein and the faint sound of whispered voices. Early one morning in 1992, a holidaying couple had a terrifying experience whilst inside the barrow; well one did, her partner was actually outside during her ordeal. She had been exploring the interior, when all of sudden she was grabbed by unseen hands which attempted to pull her towards the deepest part of the chamber. Later, when she had regained some composure, she told her partner of the terror that took hold of her as she tried desperately to break free from the invisible clutches that held her fast. She described how her whole body had become inexplicably ‘weighed down‘, like she was walking through deep mud making any movement a huge effort. It transpired she had only been in the chamber minutes but the whole sorry episode felt to her like an eternity. Avebury Manor – It is reported that a white lady drifts around the grounds of the manor and sometimes the stones, her face covered by a large hood. The manor house itself is said to be haunted by several entities. One spirit which would scatter rose petals across the floor of the Crimson Room, a phantom monk was spotted in the library, and a ghostly Cavalier sometimes makes an appearance. Diamond shaped stone (outer ring) by the roadside – This particular stone is reputed to cross the road at midnight. Field close to Silbury Hill – A government worker walking from Avebury Manor reported encountering a ghostly woman in white lace and a white hood at an iron gate close to Truslow. The witness said the woman appeared from nowhere, took his shoulders, and spun him around before pushing him away. Red Lion public house – The wife of an English Civil War veteran, Florrie was strangled and tossed down a nearby well by her husband once he discovered she had slept with other men while he was away fighting. She now haunts the public house, scratching anyone who upsets her. The sounds of a phantom coach have also been heard outside the building, while in 2004 a photograph was taken which captured the image of a bleeding bald man. Silbury Hill – No one can say for sure why the hill was built, though one group has alleged that it was the only way the builders knew of immobilizing a great evil. The ghost of King Sil is also said to ride around the base of the mound on moonlit nights, while others believe that a horse and rider of solid gold are contained within. Finally, another ghost, this time headless, is said to haunt the base. 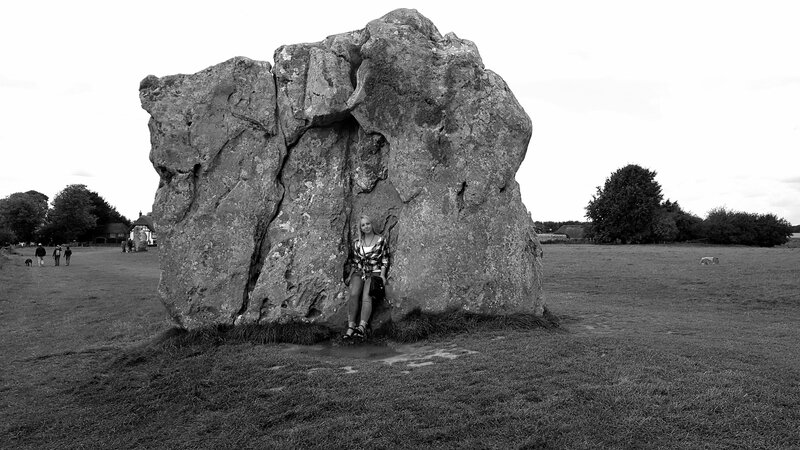 Standing Stones – Locals claim that these stones have an air of ill luck surrounding them, with several bizarre accidents occurring in their presence. At night, phantom singing has been heard going from the circles. Another person claims to have seen a medieval fair in progress while she stood in the circle. The Lodge – Stories tell of a number of phantoms said to inhabit this building, including children, a young woman, a man in Georgian style clothing, a voice speaking in French and a coach drawn by four horses. A former owner of the property believed the building to be the most haunted house in England, though the current occupier has not encountered anything and is a little more cynical. The churchyard – A witness on bicycle spotted a large white figure in this churchyard.